ROCKPORT — As Ruben Sazon waited out Hurricane Harvey in his apartment Friday, he was certain that his roof was going to be ripped off. "The howl of the wind was amazing," he said, adding that "it came in with a roar." The roof stayed in place. But the Category 4 hurricane did enough structural damage to make his home uninhabitable, leaving Sazon with no place of his own and uncertainty about what he'll do next. "This is the history-making hurricane," Sazon said Saturday of the storm that pummeled the area he has called home for more than two decades. "This the one people will always be talking about." Across this battered nook of the Texas coastline, Aransas County and its residents are beginning the difficult work of installing order and a sense of normalcy after Hurricane Harvey’s brutal arrival the night before. But unrelenting rain and wind from the massive storm are muddling those initial efforts. 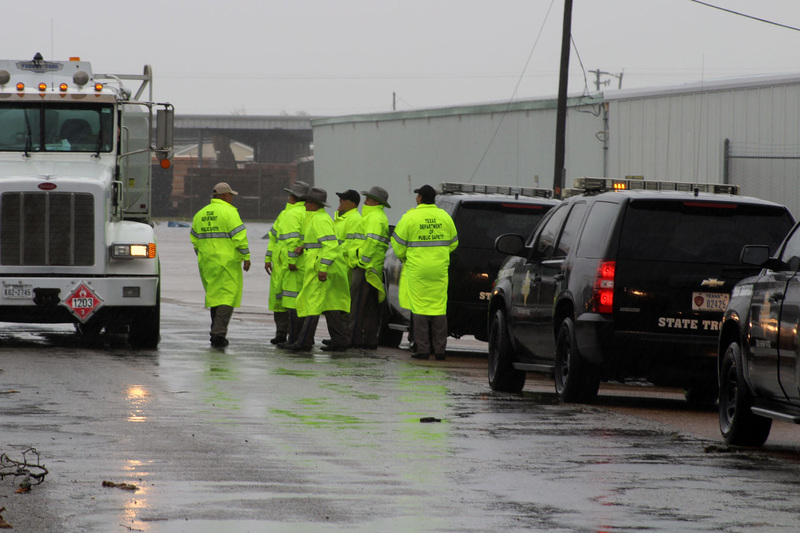 Emergency personnel poured into Aransas County on Saturday and began assessing this normally laid-back coastal community’s damage, which included complete loss of power, hundreds of millions of dollars in property damage and an untold number of impassable roads. The seemingly random scattershot of destruction — decimated buildings, snapped power poles, downed trees — alongside completely intact structures leads officials to believe that tornadoes came with the storm. 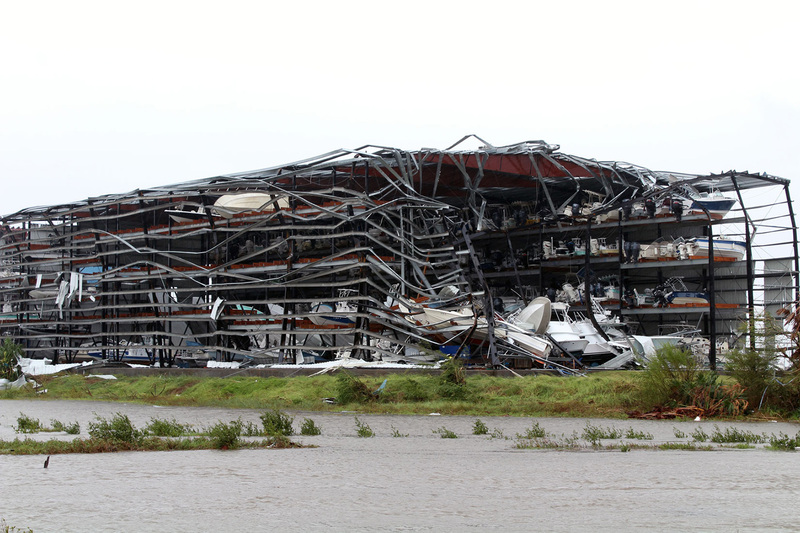 “It’s evident the way the damage is,” Aransas County Judge C.H. “Burt” Mills Jr. said Saturday. At least one person died in a house fire that officials didn’t discover until after Harvey moved through. Emergency calls couldn’t be made or answered during the brunt of the storm’s impact. About 40 percent of the 24,500 people who call Aransas County home defied a mandatory evacuation order and stayed behind. So far, only 12 to 14 people with non-life-threatening injuries required medical attention. But local, state and federal officials on Saturday had just started arduous search-and-rescue efforts to aid anyone trapped. They plan to evacuate those in damaged homes who can’t leave on their own. Despite a cavalry of regional, state and federal responders, the county’s inundated infrastructure and lack of power left local leaders unable to estimate when the tens of thousands who fled in a highway-clogging exodus ahead of the storm will be able to return home. For now, officials want them to stay out. Expectations that the rain will last days forebode worsening conditions. And as the county’s tiny beach towns begin the early stages of recovery, Harvey’s large size and slow movement will continue to threaten other parts of the state with flood damage likely to require great demand for response resources. Still, county leaders remained optimistic that the area will be restored and rebuilt. Fulton Mayor Jimmy Kendrick said residents love their community. As he surveyed damage early in the day, he stumbled across parishioners of a damaged church already cleaning up. “We are one,” he said. Ahead of the storm, Sazon, an artist and jeweler, placed his sofa upright to block the doorway to his living room, where mattress box springs blocked a sliding glass door to his second-floor apartment's balcony. Harvey’s merciless winds broke every window in his apartment. "All you could hear was things hitting, glass breaking," Toni Castillo, Sazon's girlfriend, said of the storm. On Saturday morning, Sazon headed to downtown Rockport to check on the studio where he paints, makes jewelry and sells his work. 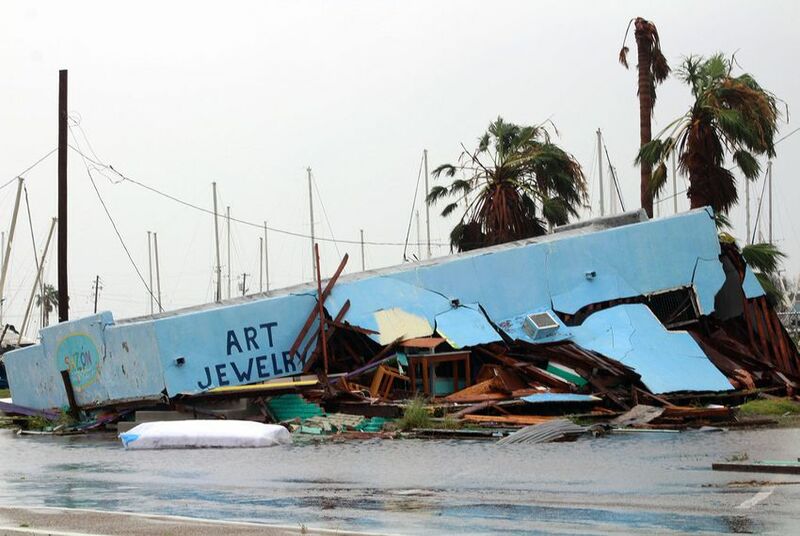 What had been a small, waterfront building with a turquoise awning facing the town’s shop-lined Austin Street was essentially nothing more than an intact roof sitting atop a pile of collapsed rubble. Sazon, who rented his apartment and the building where he ran Sazon Studio and Gallery, didn’t have insurance for either. With no cellphone service, Sazon and his girlfriend didn’t have a way to call relatives or friends. They planned to drive about 30 miles west to Corpus Christi and stay with his daughter. From there, they hoped to figure out what to do next. “It’s devastating to me,” he said from his car in front of what had been the studio. Troy and Laurie Rodgers had retired to a condo on Aransas Bay after spending decades vacationing in the small town. As Harvey approached, they decided to leave. Troy Rodgers left Friday, hours before Harvey made landfall. But Laurie Rodgers headed out the night before. The drive to Austin, where her sister lives, took eight hours, more than double the time it usually does. Cars were bumper to bumper for the first hour out of town. “Every gas station was packed,” she said. “The traffic was terrible." Their condo is a block from downtown, where a spattering of satellite trucks was parked Saturday so television reporters could do national broadcasts. The couple, like others who fled ahead of the storm, spent Saturday watching the coverage in shock over the damage reports. Like local leaders, Laurie Rodgers is hopeful despite the continuing waves of concern.